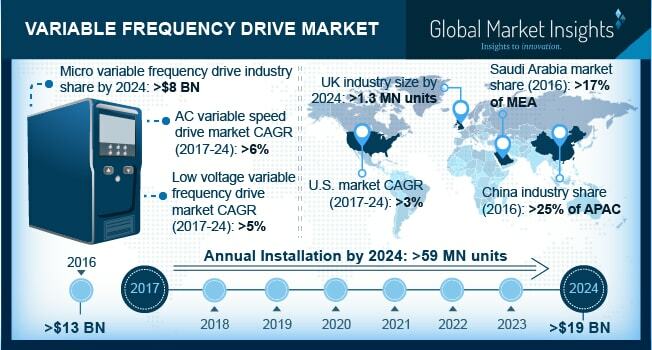 Variable Frequency Drive Market size will exceed USD 19 Billion by 2024, as reported in the latest study by Global Market Insights, Inc. Rising investments toward infrastructure development coupled with increasing manufacturing facilities across developing economies will drive the variable frequency drive market size. Growing adoption of energy efficient products with an aim to ensure energy security will complement the business outlook. Regulatory bodies across the globe has introduced various standards to encourage the deployment of energy efficient systems. For instance, the U.S. Department of Energy (DOE) plans to accomplish efficiency standards with an aim to improve energy efficiency that is economically justified and technologically feasible. UK variable frequency drive market is set to surpass 1.3 million units by 2024. Rising demand for clean energy technology along with stringent government norms toward the adoption of sustainable systems will positively impact the industry outlook. In 2014, the European Union introduced Climate and Energy target to reduce carbon footprints to 20% along with an aim to increase renewable energy share by 20% by the end of 2020. Technological advancement across industries including metals & mining, utilities, petrochemicals, steel and cement industry will stimulate the variable frequency drive market. Increasing exploration and production activities across oil-rich countries will positively impact the product demand. As per the Organization for Petroleum Exporting Countries (OPEC) the world crude oil production has witnessed an increase of 2.4% in 2016 when compared to the production of 2015. High efficiency, limited maintenance, high power factor and low cost make its adoption preferable over other counterparts. The U.S. variable frequency drive market will grow over 3% by 2024. Rising adoption of speed drives primarily across O&G and power generation sector will propel the industry growth. Introduction of initiatives toward the achievement of energy efficiency will further augment the industry landscape. For instance, in the U.S., Federal Energy Management Programme identifies affordable solutions to meet goals related to energy leadership across the country. For Asia Pacific, China variable frequency drive market is predicted to witness strong growth owing to rapid industrialization and urbanization. Rising need for energy efficiency along with high end technological advancement will complement the industry outlook. Rapid expansion by Original Equipment Manufacturers (OEMs) along with flourishing automotive industry will further stimulate the product penetration. In 2016, Saudi Arabia accounted for over 17% of Middle East and Africa variable frequency drive market share. Aggressive spending towards the deployment of sustainable systems with an aim to facilitate energy savings along with limited maintenance cost, will augment the industry landscape. In 2015, GE initiated the deployment MV7000 speed drives of 18 MW across Yanbu desalination plant. Key industry giants in the variable frequency drive market are ABB, Crompton Greaves, Amtech Electronics, Eaton, Emerson, Danfoss VLT Drives, Fuji Electric, Hiconics, GE, Johnson Controls, Honeywell, KB Electronics, Mitsubishi, Schneider Electric, Rockwell Automation, Siemens, Vacon, Toshiba and Yaskawa Electric.